Playing games is not particularly our favorite part of the shower experience. Although when we were asked to plan the games for our sisters bridal shower, we were excited and up for the task. We have found a game that has become a tradition in our family. Bridal Bingo is a game you play while the Bride (and Groom) are opening their gifts. You write down items you think they will get and / or phrases you think will come out of their mouth(s) during the opening process. Play just like regular Bingo with the goal of completing a full row. This makes things more interesting for shower guests while the happy couple inevitably receive every pot, pan, and kitchen utensil off their registry. On a side note, we usually print out an official Bingo card to fill in for this game, but we did not have it this time. Not to worry though. We improvised with an old school trick by having each person fold their paper vertically and horizontally (or “hot dog” and “hamburger” for those of you who are up with the folding lingo) in a 4 by 4 grid. For the second game, we decided to do something a little different and chose something we used to play at camp. We thought a “Sing Down” would be fun for all ages. For this game, we made groups of about four or five. Each group’s task was to come up with as many songs as they could think of in about 3-5 minutes which include the word “love”. The groups were then instructed to take turns singing a song from their list, and we were happy to hear songs from every category from Frank Sinatra to Bob Marley to Maroon Five and Whitney Houston. If a song from their list was sung by another group they had to cross it out. The group with the most songs was the winner. Every game needs a fun gift, something worth playing for. Prizes like these wine bottles and other miscellaneous jewelry, lotion, and candles kept the games exciting. What are your favorite shower games? They love the shape of this over-sized tufted headboard and think it would look amazing in a crisp, cream linen. White wood and mirrored nightstands would add a little glamour to the space. Keeping these pieces modern in shape adds to the simplicity of the overall design of the room. They also love the set up in this photo. 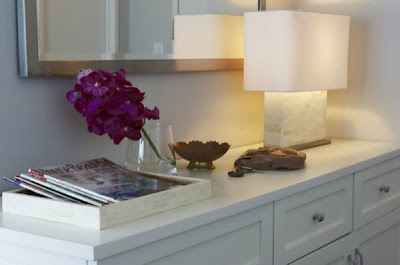 Each nightstand would hold a lamp and have a framed photo above. Lauren and Scott would love to include a few of their wedding photos in their bedroom. They would look elegant framed this way and hung over each nightstand. 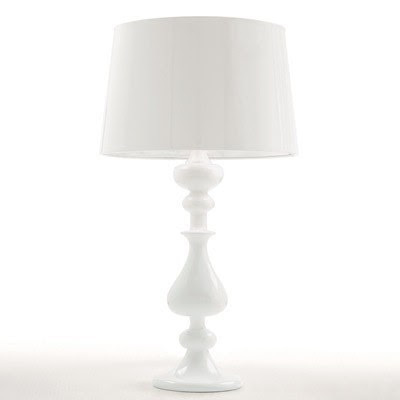 These all white lamps are the perfect look, as they are formal yet simple at the same time. 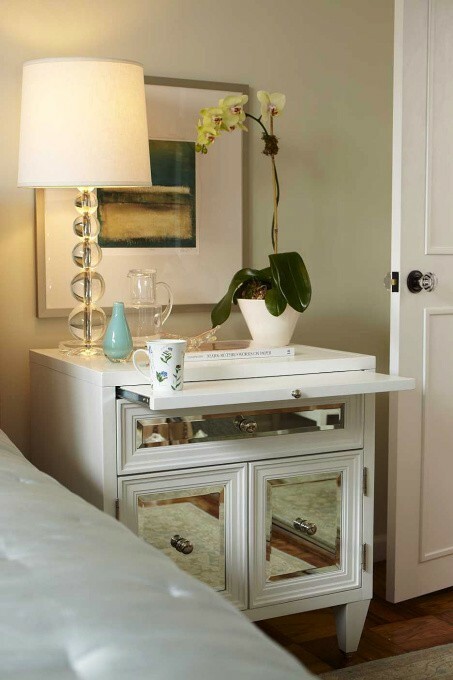 A white wood and mirrored dresser coordinates nicely with the nightstands. They would like to keep these pieces uniform so as to emphasize the headboard as the main focal point in the room. 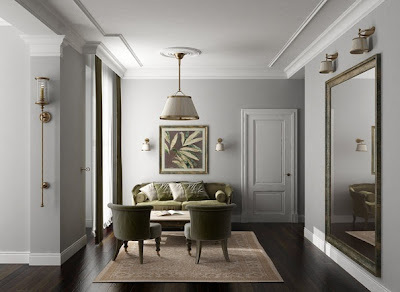 Light gray walls would look lovely against the white crown moldings and baseboards in the room, and will go well with the light bamboo wood floors they have. They also love the gold accessories found in this photo and hope to use this detail in their own space. 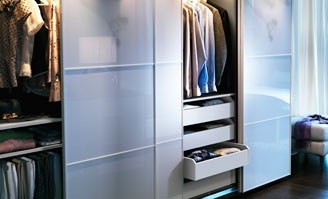 They have played around with the idea of remodeling the closet and extending it across the length of the room. This would also reorient the room making it more symmetrical. If they go through with this portion of the project, they would love to use metal framed milk glass doors like these. 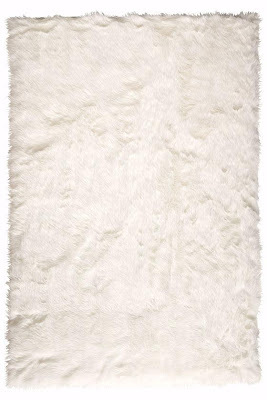 Their existing white faux fur rug will make the move across the hall to add warmth and texture to their space. Now that the inspiration photos have been selected, it is time to pick out specific fabrics, paint colors, finishes, and exact pieces to complete their budget. 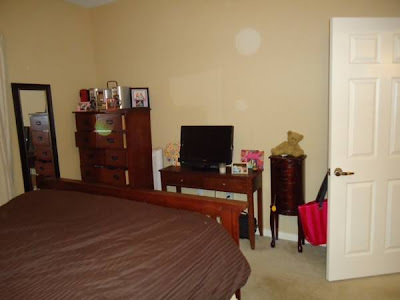 Lauren can hardly wait to begin the next steps and see their room and her vision come to life. 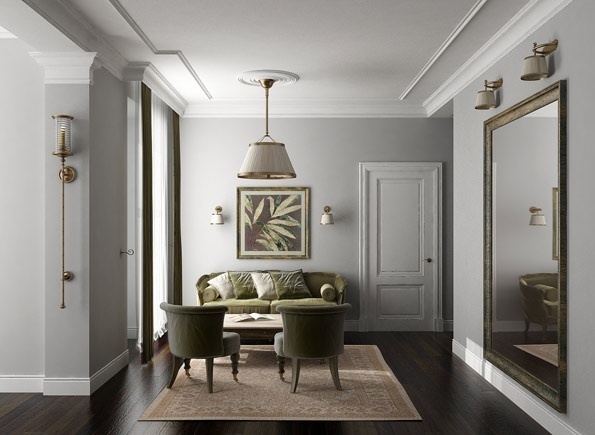 She wants a space that is modern yet elegant, warm, and cozy. Scott wants peace, tranquility, and a big flat screen TV. Stay tuned for more inspiration to come for the rest of their remodel ideas as well as photos along the way. Hi! Okay, so random but very important question … I am in SERIOUS need of a makeover for my bedroom. I absolutely hate my room right now and want to create a whole new look and vibe for the room. I’m talking furniture, wall decor, color scheme, decorations etc. Is there any way you can help me do this or give me advice? I have no clue where to even start. Please help! Here are some pics of my bedroom. This furniture I have had since Junior year of college (aka 9 years ago) … so sick of it! Also, a couple things that I currently hate about my room / want to get rid of … all the mismatched picture frames and random clutter on my desk / dresser (I’d only really like 1 or 2 pic frames in the new room). I hate the darkness. I’m planning on getting rid of the boom box, haven’t used it in years … and also never really watch the TV in my room, so I am open to taking it out of the bedroom too. P.S. This is kind of embarrassing. I honestly hate my room right now! Okay, so when I think about what I want for my bedroom … I want to create a romantic feel: beautiful bedding, candles, flowers etc … I envision myself walking in and feeling like “Ahhh I can relax now” almost like a spa type feel; just very peaceful, beautiful, relaxing, and a nice escape. As far as colors, I know I want a lot of white and I’m not sure on accent colors yet … (I’m totally open to any ideas and suggestions by the way). After receiving Sarah’s wishes for her new bedroom, she and Lauren began to plan out the room of her dreams. They worked “side by side” to come up with an overall look for the room and these inspiration pictures became their guide. Since Sarah is currently renting, she wanted to buy pieces that would work well in her space but that she also would be able to keep for a long time. They started with this bed from Z Gallerie. Its wooden framed upholstered headboard looks beautiful with its nailhead detail. To give that clean spa feel, they selected crisp white cotton bedding and added an accent pillow to create interest. 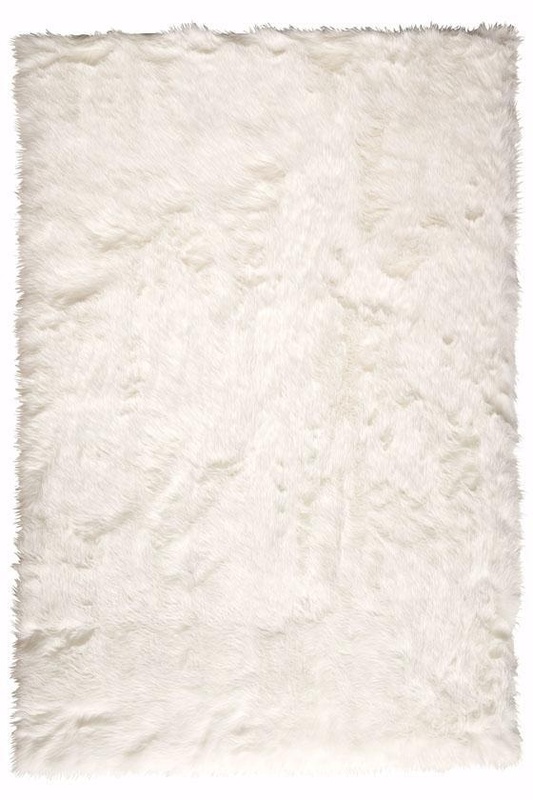 This fur throw also from Z Gallerie made her bed more warm and inviting. 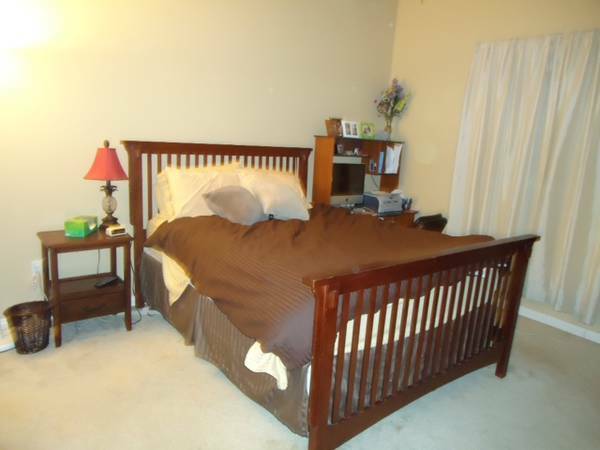 Instead of going for the typical option of two nightstands, she opted for a desk on one side to give her a work space. In order to still achieve a uniform look, they chose a small desk in the same finish as the nightstand. This Parson’s Desk from West Elm is just big enough to hold her computer and a few accessories. As Sarah and Lauren live in different states, Lauren thought it would be easiest to select pieces from stores that have locations in both LA and Vegas. She chose West Elm and Z Gallerie for their overall look. This proved to be helpful as Sarah was able to check out the furniture and accessories in person that Lauren had pre-selected. 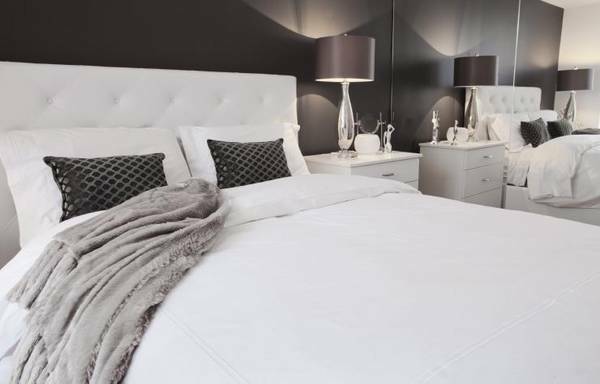 As a finishing touch, Lauren suggested that Sarah add a pop of color to her monochromatic bedroom. They loved the fuschia orchids from the inspiration photo so much that they decided they would be the perfect thing to complete Sarah’s bedroom. Overall, they achieved the look that Sarah was going for. They said good-bye to the dark college furniture and selected pieces that are sure to make Sarah feel more at peace in her sanctuary. With our sister’s wedding just around the corner, we are on a health kick right now. Trying to make sure we will look our best for all of the photos. Here’s a Friday bonus recipe for a delicious and healthy homemade vanilla almond granola we just made for the first time. Ingredients include: 3 cups oats, 1 cup almonds (we used sliced instead of whole), 1/2 cup honey, 1 tablespoon canola oil, 1 teaspoon vanilla, and 1 teaspoon cinnamon. However, feel free to add other ingredients you like (dried fruit, nuts, etc.). 1. Heat honey, vanilla, canola oil, and cinnamon in a small pan over medium heat until completely combined. 2. Mix oats, sliced almonds (and any other dry ingredients you like) in a large roasting pan. 3. Pour honey mixture over the oats and stir until dry ingredients are completely coated. 4. Bake in the oven at 350 for about 45 – 50 min. stirring every 10 min. or less. If you do not stir, your granola will burn. It should end up crisp not chewy, and your house will smell delicious during this whole process. 5. Let cool completely and store in an airtight container. Make a delicious and nutritious breakfast complete by adding your homemade granola to a cup of yogurt with fresh fruit (We used lowfat Kefir plain yogurt with sliced strawberries and blueberries). This is quick, easy, and perfect to take on the go. One batch of granola and you will have breakfast all week, and we will stay healthy and trim for Rebecca’s wedding. Our guest blog today comes from our friend, Hannah. You may remember her from our posts: Save the Date and What to Gift Your Wedding Party. Hannah is a make up artist, a director, a photographer, and an all around crafty person. What does she not do? Today, she has offered to share one of her many talents with us and all of you. So with out further ado … we turn this blog post over to our guest blogger and friend, Hannah. I got the idea to make this decorative framed letter after perusing Pinterest for something to make my boyfriend for a housewarming gift. (We all know that crafting for dudes is near impossible!) However, “letters” seemed to be a huge trend all across the board (no pun intended) and while at Michael’s one day (AKA: the Mothership) I came across these super cool big wooden letters. I picked one up and was taken back by how LIGHT it was! As a paper craft lover, this got me excited and I was immediately inspired to make a craft around this letter. I then rushed to the open backed frame section (Michael’s has the coolest frames in my opinion), and then raced over to the paper aisle to find some manly paper to match my guy’s newly painted loft. A decorative famed letter?! Perfect. Crafting for girls is a cake walk. We usually like anything with flowers, glitter, cupcakes, cats … need I say more? So, I knew making one of these bad boys for a girl would be a piece of cake. So enough of the cake talk (because now I’m getting hungry) and let’s get on with some helpful hints on how to whip one of these up. They make GREAT gifts! Pick a “theme” or a color scheme for your piece. I suggest starting with finding the paper first and then basing your embellishments and paint colors around that. Lay out all the goods. It’s nice to see all your supplies spread out in front of you to remind you of what you’re working with. You can even do a mock up of what you want it to look like before you start! By now, you should have some sort of game plan for what you’re gonna do. Paint the letter. You’ll want to do this right away so your paint is dry by the time you’re ready to glue that sucker on! Cut your paper to fit the size of the frame. I usually use the faux picture that comes inside the frame when you buy it and glue my paper onto that. You can also use a slightly thicker piece of card stock or cardboard however. Then glue all your paper down to get your base goin’. Try some ripping techniques as you layer your papers down. It’s best to rip the paper in a way that you see some of the white. I like to get creative with layering paper and lining the ripped paper with a black ink pad has been a signature touch to most of my crafting projects. It gives it a vintage, edgy touch. Glue your painted letter onto the paper (it should be dry by the time you get to this step) and start adding your embellishments! The final touch: Rhinestones make any craft a better craft. Never forget that. Once everything is all glued on, put that little beast into the frame! Be sure to take out the glass on the frame too. The letter has some dimension to it and will most likely not fit properly into the frame with the glass in it. And there ya go! A fun and super easy craft! Remember, there is no wrong way to do this! So have fun with it! Thank you Hannah for this amazing DIY tutorial. Readers, if any of you would like to be our next guest blogger, we would love to include your projects in our blog. You can contact us by posting a comment below or emailing us at sidebyside.design@yahoo.com .